Horse Medicine furthers Anderson’s oeuvre. I use such a word with specific intent, for in Horse Medicine the reader finds subjects familiar to those who know his work. Yes, there is war and heartbreak and love. And yes, survival. And there is the poet with his enviable range of voice and vantage. It’s tempting to say that he continues his themes, that he extends his subjects, but this is a bit too facile a way to confront what we have here. The poet of Horse Medicine is indeed the poet of The Moon Reflected Fire (and the remarkable Blues For Unemployed Secret Police ) and yet he is not. Not quite. His shadow has grown longer, his days more precious. These new poems seem to exhale and gracefully bend themselves toward resolution and acceptance even as they treat “How we make war on our lives: as if we deserve/more than a gleam of light caught in the fall/from womb to grave. Horse Medicine vibrates—hums—with a formal tension that lights up each poem and resonates in the very nerves of the reader. This voltage has been in Doug Anderson’s poetry from the beginning and it continues here, evolving, adapting, to the stages of the poet’s life and time. Anderson has carried out his Raids on Homer. Anderson addresses Sappho. Nice allusions, nice references, but when we take them in the context of his method, we begin to understand the intelligence here, for Anderson at his best—he is always at his best—marches with solid narrative cadences as Homer did, and yet alights upon perceptive moments of reflection with the rapt lyric attention and song we have learned from Sappho. Anderson’s skill with both narrative and lyric, his ability to modulate these impulses, to combine them, to surprise us with modal turns, are no small features in this book’s success. There is no sameness here, no decadent retreat from the world by immersion in empty language. He does not simply record. Nor does he contort into desperate arabesques to fancy up his lines. No, nothing here is arch or—god help us—trendy. It is poetry. the gardens, lost or found, of his exquisite poems. And so we endure. Do the angels admire us? Do we confuse them? Why are they listening? (I certainly hope Rilke and Swedenborg are listening.) Notice not only the argument of the lines but also the three-beat drumming, the sway and push, the imperative mood of the sensate verbs listen and see. We are captured and propelled by a masterful kinesis. He makes it look easy. in its psalm-rise and insomnia is prayer. by fool light I will step off the cliff and fly. Once you get your breath back and steady your knees from getting through those first two lines, see what he does with rise, insomnia, and light. In poem after poem such deft, almost invisible touches, electrify, and yet they do not call attention to themselves, they don’t show off: you simply glide through passages and come out of them knowing that something has been done to you. Your head is working in a slightly different way. You have been moved. 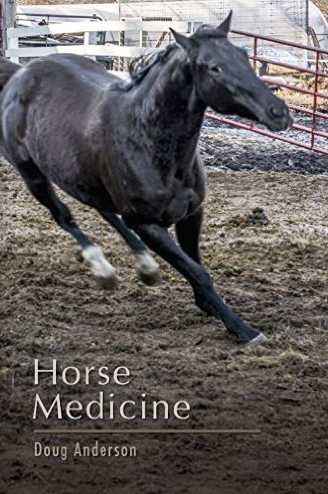 Doug Anderson is one of our best poets, and yes, he is a master of the art’s large and small mystifications, but Horse Medicine is more than just a master’s assimilation of craft. It is another work that is part of that oeuvre I spoke of: The arc of the poet’s work, but also, if the artist is true, the arc of a life that opens and gains and accrues across the grid of time and experience. Anderson stands in the world, and despite wandering and wondering, sampling and settling, he knows exactly where he stands: at the center of his authentic life. Everything we get from him is real: fear, courage, anger, tenderness, desire, thought, the wars inside, and the battles outside. Oh, yes, and love, the greatest of all encounters, as he reminds us, quoting Paul of Tarsus in the title of one of his most moving poems. That's where his poetry comes from, heart and soul and mind. That’s where all great poetry comes from. Of course it is impossible, in such limited space, to give true sense of the scope of this book. You will see for yourself. You will be lying in a crossfire between two snipers, you will hear about an Armani suit for Jesus, witness a prison riot, oh—and the way that woman lifts the hair off her neck in the heat! The poet would blow on it like a coal. Read Horse Medicine. Then read it again. And again. You will be in the presence of something larger than yourself. I believe it’s something to be thankful for. BIO: Doug Anderson's book The Moon Reflected Fire won the Kate Tufts Discovery Award and he has received a number of fellowships, including from the National Endowment for the Arts. He teaches in the department of comparative literature at the University of Massachusetts – Amherst.